White Gold, the new comedy from Inbetweeners co-creator Damon Beesley, which follows the triumphs and balls-ups of a trio of window salesmen as they try to shimmy up the greasy pole to success. 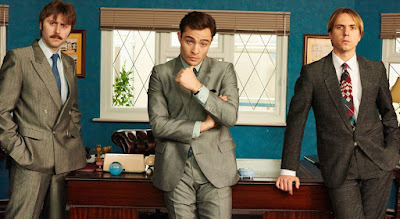 Gossip Girl’s Ed Westwick is Vincent Swan, a smarmy family man (who continually cheats on his wife) with the nous to play the lucrative double-glazing game for massive profit. Inbetweeners stars James Buckley and Joe Thomas reprise their aimless banter as Fitzpatrick and Lavender: the former a grownup version of Jay – idiotic, crude and a chronic liar – while Lavender is the everyman thrown into this slightly hellish workplace.